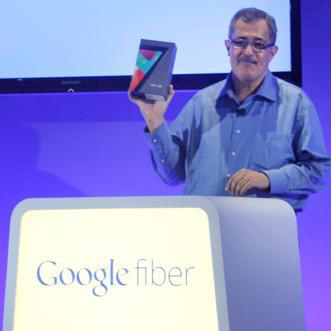 There are loads of people who wish Google would offer phone service, and as it turns out, the company considered doing just that for its Kansas City rollout of Google Fiber, said Milo Medin, vice president of Google Access Services. According to Medin, who spoke about this on Monday during the CityAge Summit on the New American City at the Kauffman Center for the Performing Arts, Google looked into providing VoIP (Voice over IP) service, as it would've cost "almost nothing. However, in the United States, there are all these special rules that apply." The special rules he referred to were the different state tax calculations that vary from Kansas to Missouri. The company would've had to develop a billing system to work that out, and so it decided to forego it for this rollout. Whether Google will or won't consider it in the future, however, is anyone's guess. Some folks think, if the Android maker wanted to provide voice services — apart from Google Voice, that is — the natural place to do that would be in the cellular market. But we're a long way from seeing any definitive confirmation of that happening in the near future. What do you think? Would you be interested in a Google cellular or VoIP service? Let us know in the comments.